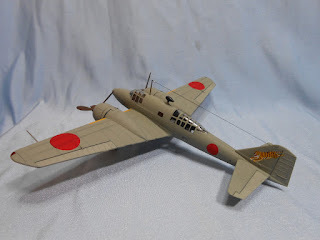 Another fine Hasegawa Ki-84 Hayate 'Frank' in 1/48 scale, this time completed and kindly shared by Shimon Halperin. 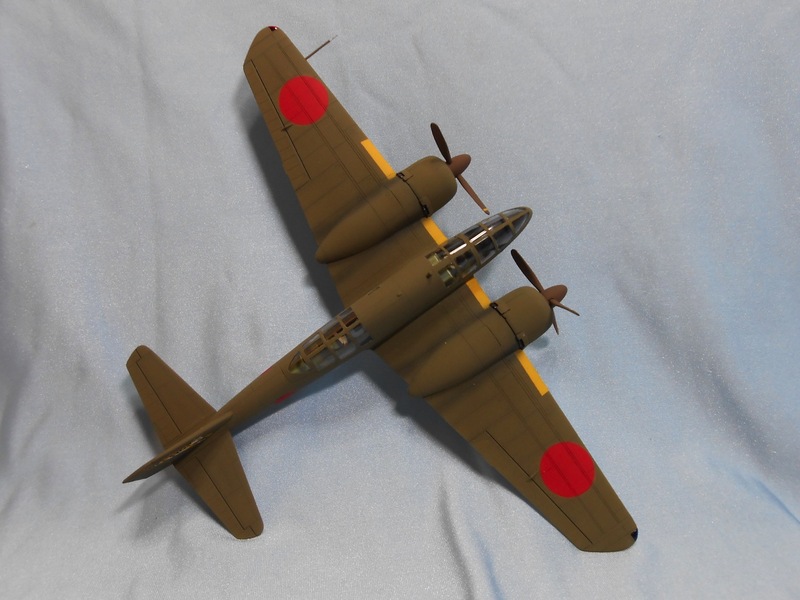 The model represents an aircraft of 185 Shimbu-tai and Shimon describes the build as straightforward and pleasant. His main concern was for the colours of the original. An anti-glare panel ( he mixed black with some light blue). 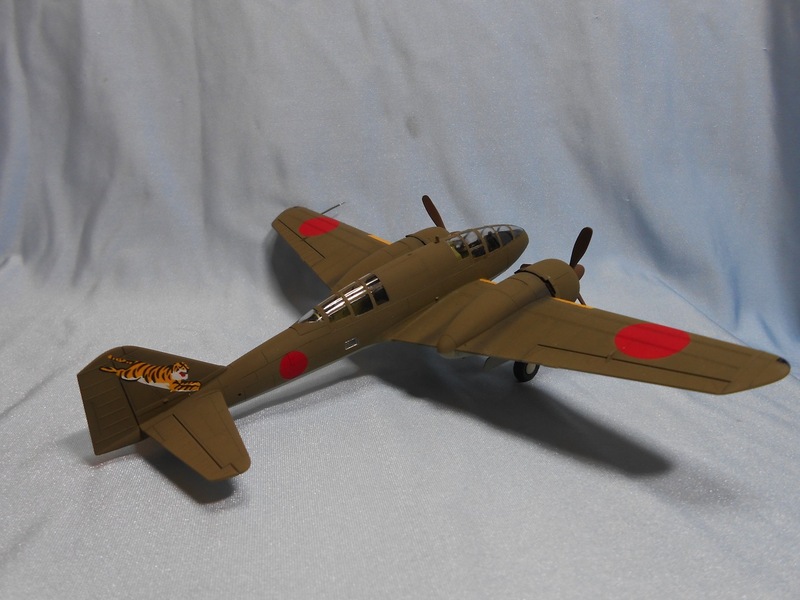 The olive drab color of late war Ki-84 using Gunze Mr Color C304 (Olive Drab FS 34087), with the upper surfaces a lighter shade mixed with yellow. 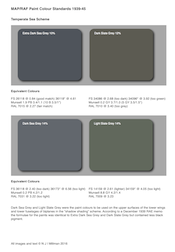 Light grey under surfaces using Gunze Mr Color C128 (Gray Green). A grey-green propeller using Gunze Mr Color C319 (Light Green). Yellow-green drop tank using Gunze Mr Color C27 (Interior Green). Shimon applied moderate weathering guided by photos of Hayate and painted on most of the stenciling using masks. 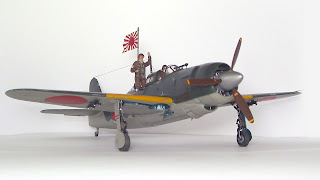 During the project he discovered that the Montex masks for the upper and lower wing hinomaru were under-sized by about 1.5-2mm and would spoil the appearance of the model. So he made his own masks for them and was happy with the result. 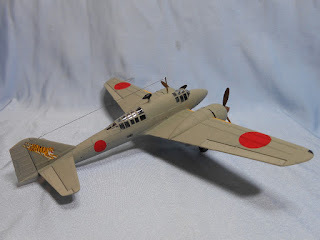 With special thanks to Shimon for sharing these images of his Hayate model. 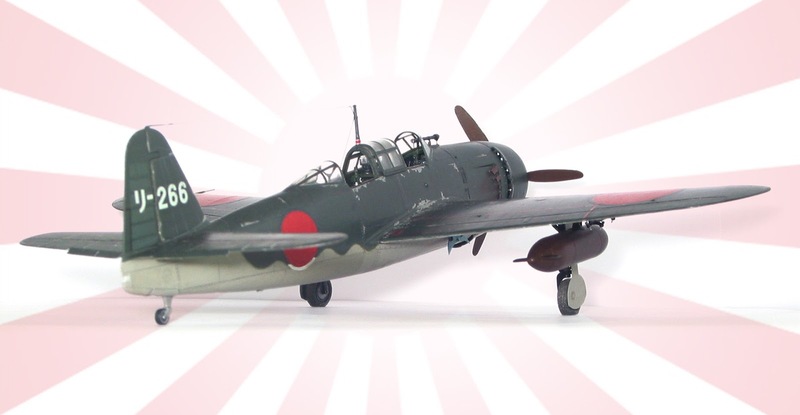 Michael Thurow concludes the report on his build of the Fine Molds 1/48 Kugisho D4Y3 Suisei with an absolutely splendid image of the model "in flight". Part one of my modelling story here ended with the assembly of the fuselage. As I have described the Fine Molds kit is problematic in some areas but the biggest issues were behind me. I now needed to make a decision about the final livery of my Judy. 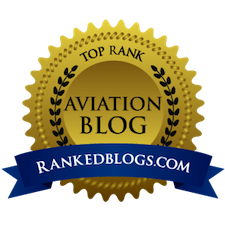 I consulted all available publications for a suitable subject as I prefer building aircraft for which photos exist. My choice fell on リ-266 (ri-266) from the Hyakuri Kokutai, an operational training unit. 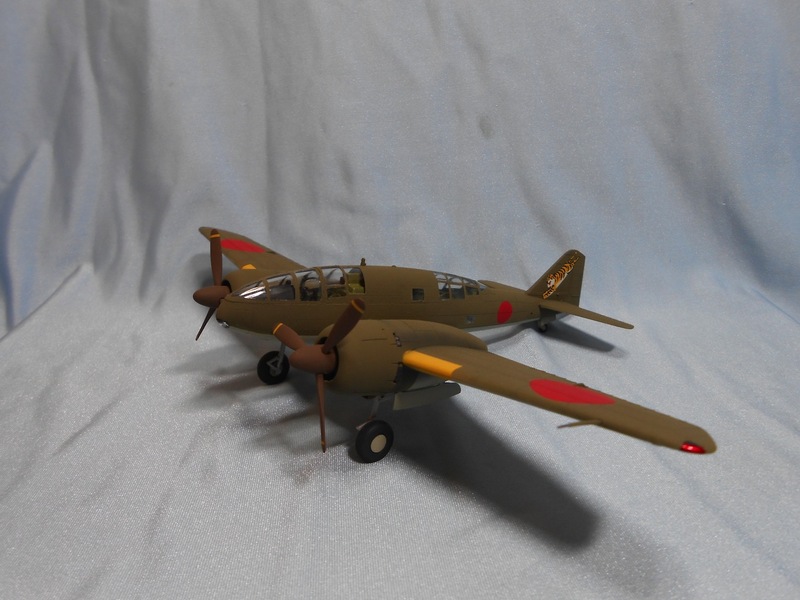 リ-266 was involved in at least one combat mission in November 1944, flown by pilot Lt(jg) Kiyoshi Arasu with no navigator on board. My selection was influenced by the shiny metal propeller and the pair of drop tanks, which both nicely disrupt the all too standard camouflage pattern, and the リ-266 decal included in the kit supported my decision. 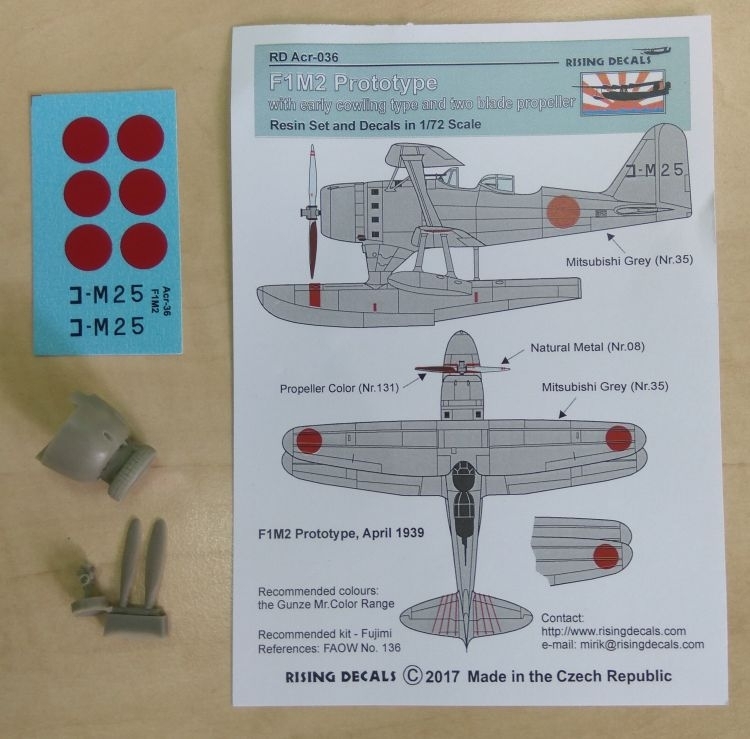 The two pictures published in FAOW and in Model Graphix show the plane from two different angles and give a good idea of the amount of chipping required. I modified a Model Graphix profile to visualize how the result ought to appear. The wings assembled easily and fitted the fuselage with little effort. To achieve the same dihedral on both sides I had to fill a small gap on the fuselage joint of one wing (I forget which). The moulded navigation lights were replaced by home-made transparencies all around, and a metal pitot tube from Fine Molds was added. For D2 Green Black I mixed Revell 363 with 10-15% each of Revell 9 Black Grey and Xtracolor 504 Exhaust. The J3 Ash Grey is Revell 75 toned down with some Revell 84 Leather Brown. The correct size of hinomaru is best provided by the Revi 48002 decal sheet but they are extremely thin and have to be positioned quickly. I overpainted the original white borders by hand with a darker green. The fuselage was chipped according to the original picture and the wear around the control surfaces and the walkways followed the pattern seen in many photographs. The wheel bays are fine and there is a photo-etched upgrade piece simulating holes. A well detailed pair of white metal struts and actuators is included in the kit. I just improved the brake lines only and drilled holes into the yokes. The excellent gear covers in the photo-etch set had to be shortened and required some grinding of the gear's protruding actuator connecting point in order to position the covers parallel to the struts. I fabricated my own brackets for the inner wheel doors - note that the doors are attached to the fuselage with a gap between wheel well and door hinge. The wheels from the MasterCasters 48013 set, which I had purchased, have sprockets and were no improvement over the kit wheels (I didn't find any pictures showing sprockets). So I used True Detail wheels left over from my Raiden. A number of IJNAF planes, among them the J3M, N1K and D4Y, used Zero-type wheels. The tail wheel, though fixed in extended position, has shutters which I formed from stiff paper. They also help to conceal the poorly depicted transition between the wheel base and fuselage. One reason for my choosing リ-266 was the drop tanks, as mentioned. Great idea, but where to get the right tanks? From the pictures I identified them as 330 litre late wooden tanks. After a long investigation I found them in Tamiya's J1N1-S Gekko (early version) kit, which was only still available through Ebay. 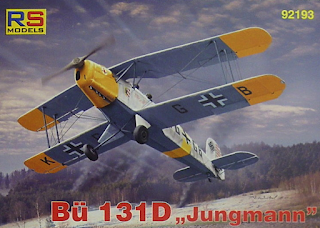 It's a nice kit for future modelling and it will forgive me the cannibalizing. The tank pipe had to be cut and moved in front of the attachment strut (reversed on the Gekko). The tanks' colour is mysterious. It appears darker than the green of the fuselage. 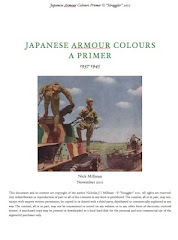 Colour drawings in some books show a very similar, but not the same (metal) tank in black. 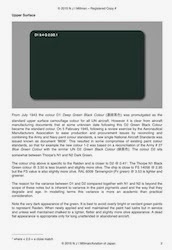 I could not find black as a regular external colour nor a primer on IJNAF aircraft. Maybe the authors derived it from the rubber coating of self-sealing wing tanks, but external tanks were not thus protected. 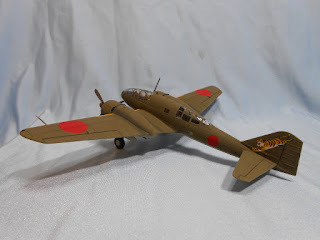 Since they were made from wood, I finally decided that the colour should be some sort of brown which would represent a glaze or lacquer as can been seen on wooden parts of some Japanese planes of the late-war period. I applied two layers of thinned black over it to obtain an irregular, streaky surface. The kit provides nicely shaped pylons. Comparing them with dozens of photos they appear about 5 mm too long. Maybe different pylons were used for different bomb loads but I just couldn't find evidence of any elongated ones. So I cut away some length at the ends and in the middle, and added more detail. My last act in every build is to instal the propeller. Beforehand, I had attached the antenna mast, which is delicate work because of the small area for fixing, and had produced a foot step from small scrap. When you look at the aircraft profile there is a gap, about 1 mm in 1/48, between the rear prop plate and the front edge of the cowling. Of course I had checked the fit and perspective of the propeller a few times during the process. Now looking at my finished model I was frustrated by the unpleasant nose-heavy appearance of the large spinner! Re-measuring every detail it turned out that the Fine Molds spinner with back plate was about 1 mm too long. It would have been easy to cut while still in pieces. But now? Finally, by some sanding at the rear end reducing the distance to the cowling was successfully accomplished. What a difference a millimetre can make! (I'm ashamed to admit that during the on-off testing of the prop I eventually broke the antenna mast…). All's well that ends well. After of a year-long modelling journey with many surprises I'm happy to have built this exciting model, and I hope that you enjoy the pictures as much as I enjoy my Judy. Image credits:- All model photos © 2017 Michael Thurow; Photographs from Famous Airplanes of the World (FAOW) No. 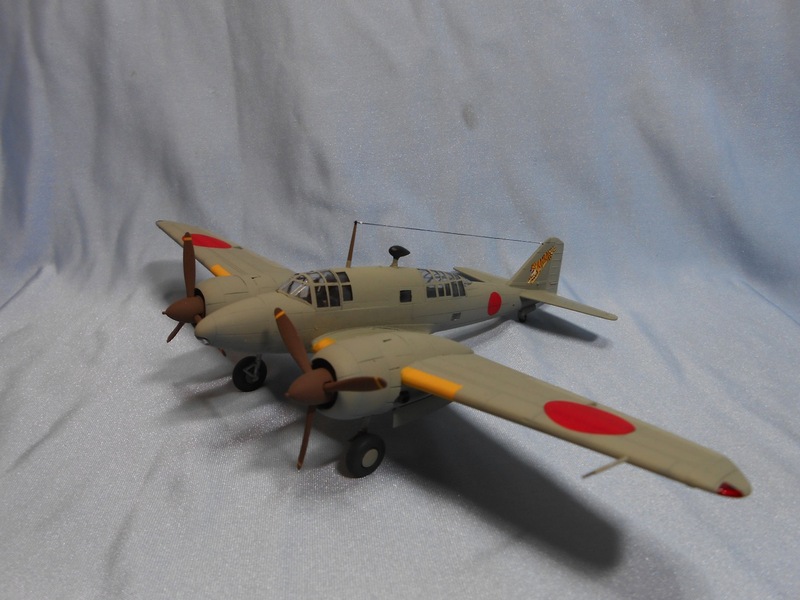 69 Navy Carrier Dive-Bomber "Suisei" © 1998 Bunrindo Co., Ltd., and The IJN Carrier Bomber Suisei D4Y Series © 2012 Dainippon Kaiga Co., Ltd., via Michael Thurow. 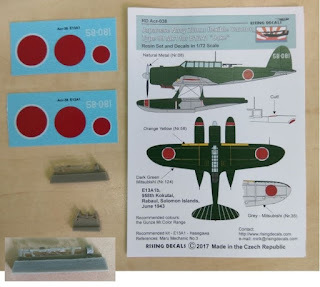 Two recent 1/72 accessory sets from Rising Decals, really mini-conversion resin sets with decal sheets for a single aircraft, focus on IJN floatplanes. 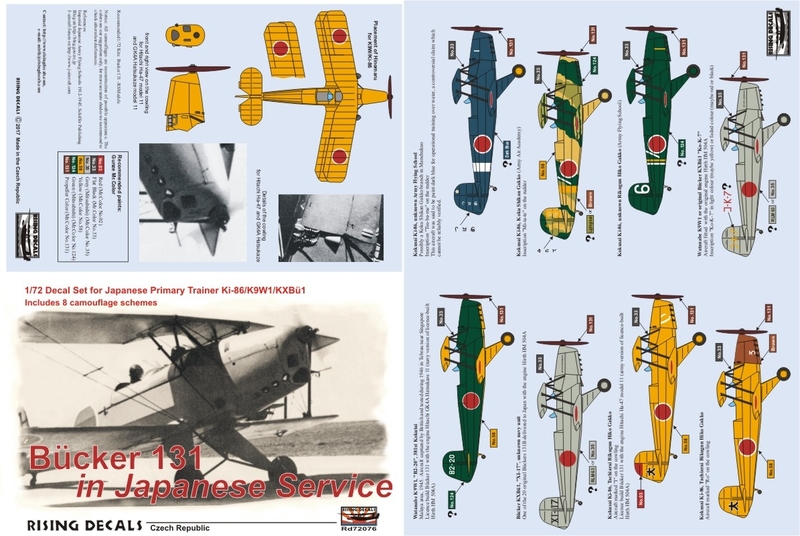 Set RD Acr-036 provides an early style cowling and two bladed propeller to build the Mitsubishi F1M2 'Pete' prototype from the Fujimi kit and finish it in overall grey with the tail code コ-M25. The resin parts consist of a sharply moulded replacement cowling, together with a propeller boss and two separate propeller blades. These will require careful cutting from the resin moulding plugs they are attached to. 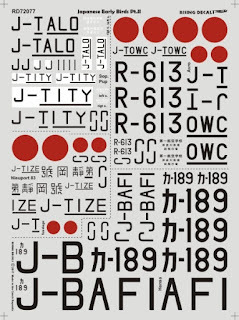 The decal sheet consists of six plain Hinomaru and the requisite tail codes in black. 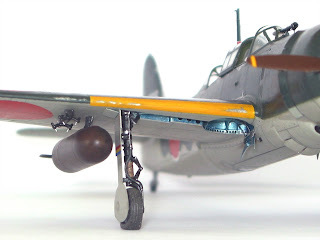 Set RD Acr-038 provides beefed-up rear armament for the Hasegawa Aichi E13A1 'Jake' in the form of a Type 99 Mk 1 20mm flexible cannon. 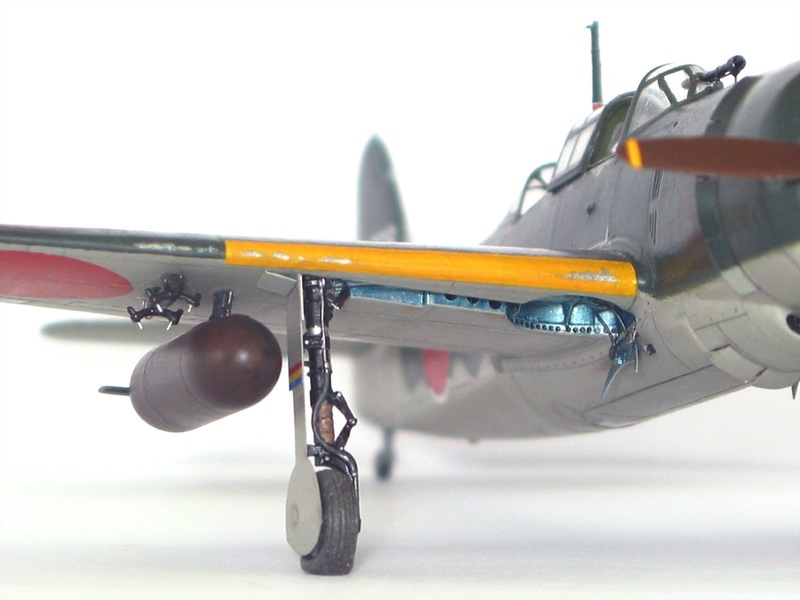 The resin parts in this set consist of the exquisitely moulded cannon, separate magazine and gun mount which will require modification of the canopy and rear fuselage for display. 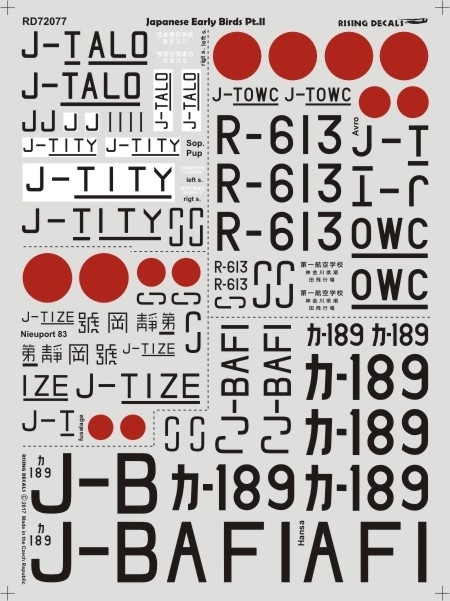 The subject of the decal sheet is in standard finish of dark green over grey with the white tail code 58-081 to represent an aircraft of 958 Ku at Rabaul in June 1943. Note that the wing stencil lines shown in the schematic should be silver - aluminium painted - and not yellow as shown. 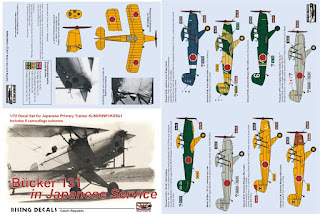 Rising Decals continues to produce interesting accessory and decal sets for lesser known Japanese variants and these should appeal to IJN enthusiasts as well as floatplane enthusiasts in general. With special thanks to Mirek of Rising Decals for the samples. 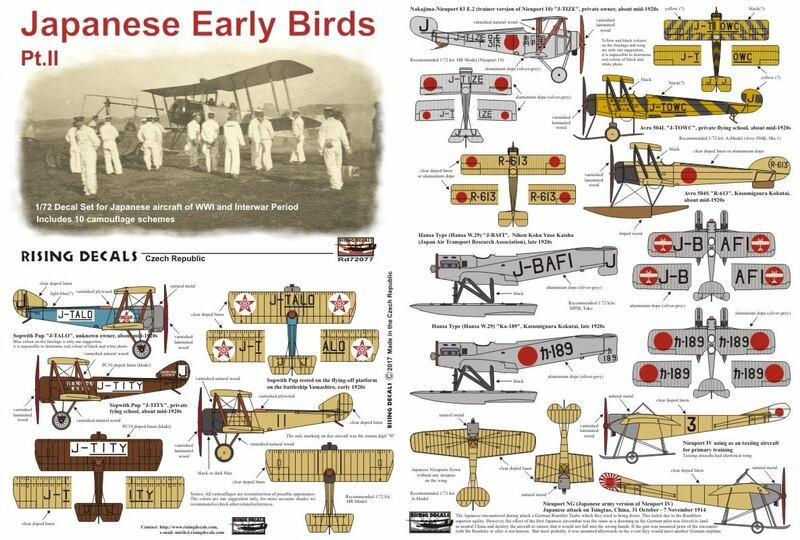 The latest decal sets from Rising Decals include Japanese Early Birds Pt.II (RD72077) offering a fascinating and eclectic selection of no less that ten colourful civil and military types, with biplanes, floatplanes and a monoplane from the WWI and Interwar periods. Sopwith Pup c/n 534 J-TALO is a Loire et Olivier built machine flown in Japan during the mid-1920s. It sports quasi-military style markings on the wings and fuselage of red stars on white roundels. The colouring suggested by Rising is speculative but colourful. Sopwith Pup c/n 536 J-TITY is another Loire et Olivier built machine registered to T Aiba at the Nippon Flying School in April 1924. 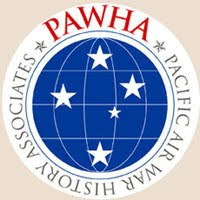 This aircraft retains its military colouring of PC10 or PC12 and has the civil registration on white rectangles together with legends on the fuselage and tail in kanji characters. Sopwith Pup 'II' was flown off the battleship Yamashiro duting the early 1920s and is in plain clear doped linen finish with black or dark blue cowling. There are no national markings and just the 'II' marked on the fuselage sides. Nakajima Ko 2 -Nieuport 83 E.2 c/n 504 J-TIZE, a trainer version of the Nieuport 10 registered to J Aoshima in June 1924 and displaying Hinomaru on its silver doped finish. Avro 504L c/n 424 J-TOWC registered to E Munesato of First Aeroplane School in September 1924 and sporting an unusual and striking scheme of black diagonal stripes on a yellow finish, the colours being speculative. Avro 504S floatplane R-613 of IJN of Kasumigaura Ku during the mid-1920s in clear or silver doped finish and displaying Hinomaru in six positions. Hansa Type W.29 floatplane J-BAFI registered to Nihon Koku Yuso Kaisha (Japan Air Transport Research Association) in July 1928. This registration was later re-allocated to a Nihon Hikoki NH-1 Hibari in June 1936. 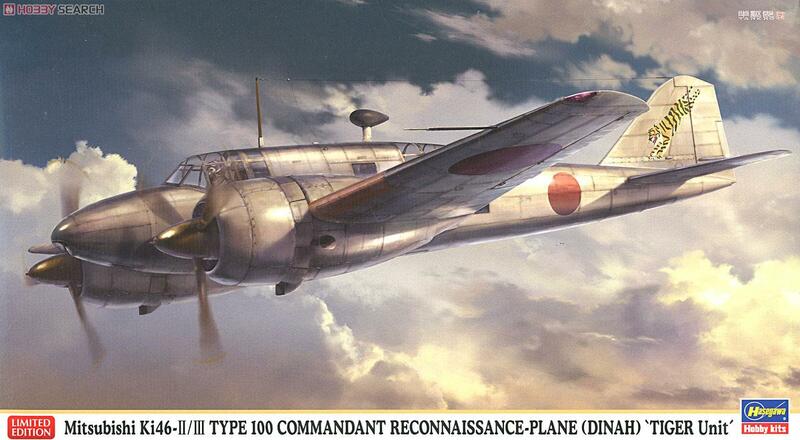 This aircraft is finished overall in aluminium dope with Hinomaru-type roundels on the wings displaying a white plan view of a Hansa. Hansa Type W.29 floatplane Ka-189 of Kasumigaura Ku during the late 1920s in overall alumnium doped finish with Hinomaru in six positions. Nieuport IV monoplane '3' used as a taxi trainer with clipped wings. National markings on this aircraft consist only of a Hinomaru on the white painted rudder. Nieuport NG monoplane flown during the Japanese siege of Tsingtao, China, October-November 1914, in clear doped linen finish with Rising Sun insignia on rudder. This is a brilliant set and the inclusion of the historically important Nieuport NG monoplane with that tricky to paint Rising Sun on the tail is especially welcome. 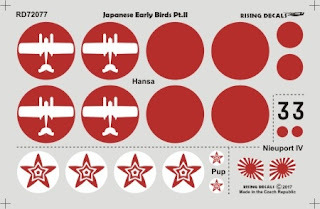 The Imperial Japanese Army Flying Corps detachment at Tsingtao under the command of Lt Col Yoichi Arikawa deployed four Maurice Farman biplanes and a single Nieuport NG 2 monoplane from Lungkou airfield. These aircraft together with the IJN Maurice Farman seaplanes (one Type Ro-Otsu equipped with two-way wireless and three Type Fu) flown during the siege achieved a number of aerial records, including the first use of a seaplane carrier during war (Wakamiya Maru), the first dropping of bombs with fins (converted artillery shells 14lbs up to 45lbs) against ships, the first night bombing (on 28 October 1914) and the first air-to-air combat (disputed by the French). Hotchkiss-type machine guns were fitted to the Maurice Farman and possibly the Nieuport. The Army contingent flew 86 sorties achieving 89 hours of flight time and dropping 44 bombs in 25 sorties. The IJN contingent flew 49 sorties achieving 71 hours of flight time and dropped 199 bombs. The German aviator Lt Gunter Pluschow flying the single Etrich Taube monoplane opposing the Japanese claimed to have shot down one of the Farmans using a 9mm Mauser pistol, possibly killing a Lt Shigematsu. 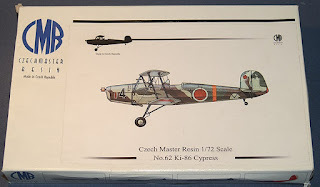 Recommended kits are HR Model for the Pups and Nieuport 83, A-Model for the Avro 504s and Nieuport monoplanes and MPM or Toko for the Hansa floatplanes. 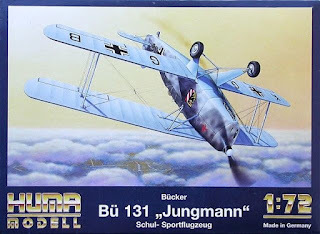 The older Airfix Pup and Avro 504 could also be used. 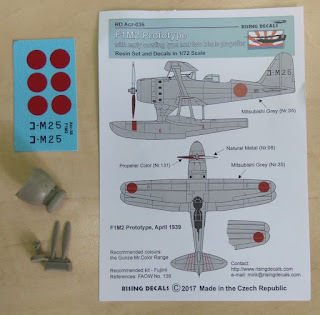 With special thanks to Mirek of Rising Decals for providing the review sample. 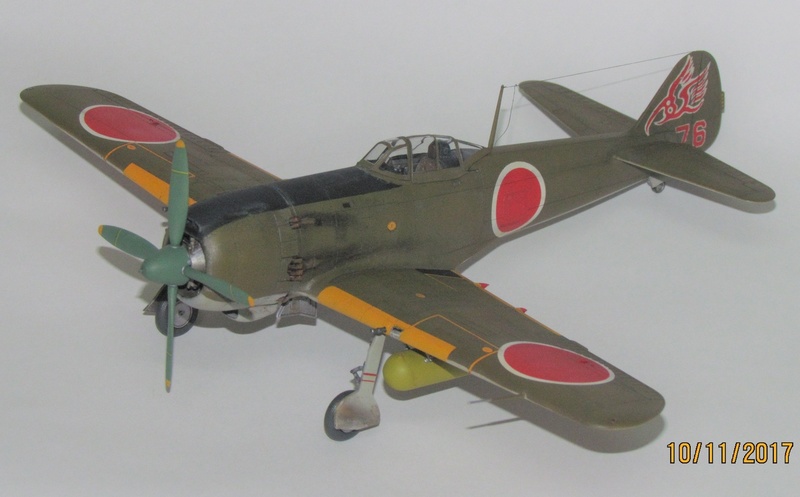 Stewart Nunn has very kindly shared these images of his completed 1/72 Hasegawa 'Tiger Unit' limited edition combo from 2014 featuring the Mitsubishi Ki-46-II and Ki-46-III. The models represent aircraft of Dokuritsu Hiko No.18 Chutai (18 Independent Air Squadron) at different times, the Ki-46-II from 1943 and the Ki-46-III from 1944. The unit served in China from August 1942 until the end of the war. Stewart built the models straight from the box using only Eduard canopy masks. 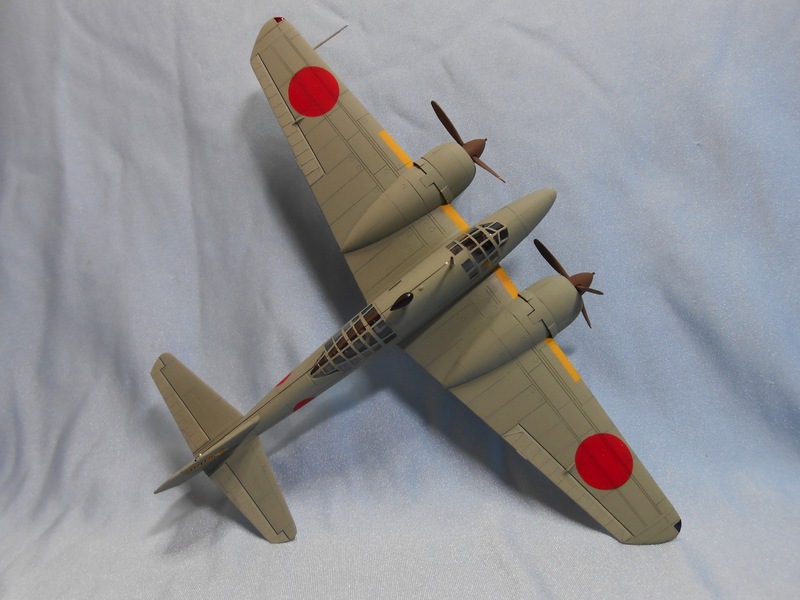 The Ki-46-II overall paint finish is Sovereign Hobbies Colourcoats ACJ12 Hairyokushoku (grey green). 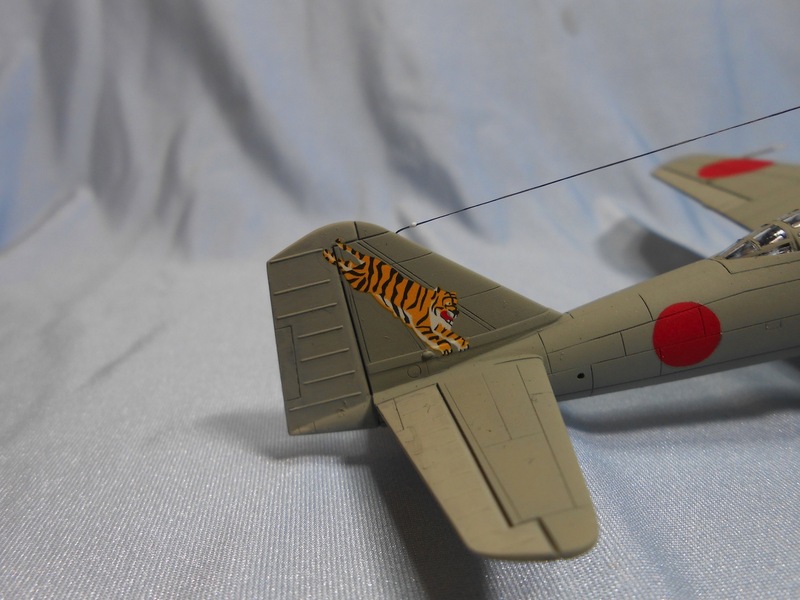 The national markings were masked and sprayed with Colourcoats ACJ20 Hinomaru Red, whilst the yellow leading edge IFF strips were ACJ19 - ID Yellow. 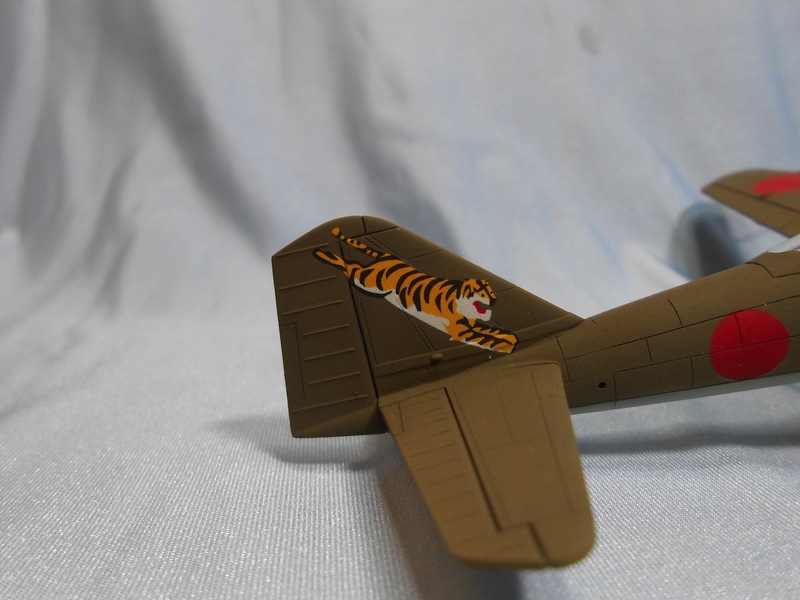 The kit decals were used for the tail marking and according to Stewart were very nicely produced and worked perfectly. The Ki-46-III was finished on the upper surfaces with ACJ22 IJA Ohryoku nana go shoku (the late war olive drab colour) and for the under surfaces Stewart mixed that paint with white to approximate the tonal contrast seen in photographs. Again the Hinomaru and IFF strips were painted on, with the tiger insignia from the kit decal sheet. Stewart reports that both kits went together really well resulting in a very pleasant build and that he was very happy with the finished result. With special thanks to Stewart for sharing these images of his two excellent models of the elegant and aerodynamic Type 100 Command Reconnaissance Plane (Hyaku Shiki Shireibu Teisatsu-ki - 百式司令部偵察機) known to the men who flew her as 'New Command Recce' (Shin Shi-tei - 新司偵), to the Allies as 'Dinah' ("with the finah linah") and to generations of modellers as the Ki-46. Late-war IJNAF combat aircraft seem to be less popular among enthusiasts than the colourful heroes of the Pearl Harbor attack. 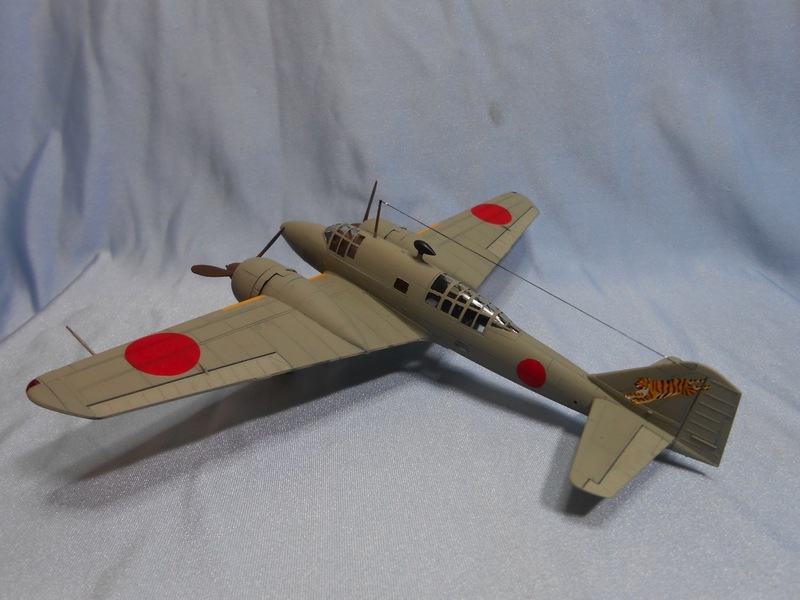 The Kugisho (Yokosuka) Suisei, however, is a fascinating subject for many modellers. 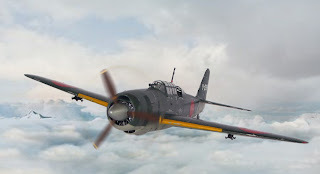 That might stem from its versatility as bomber, fighter and recce plane, or from the alternative appearances of in-line versus radial engine, or simply from the way it looks when airborne, fast and aggressive, especially with that radial engine. I was surprised at how diminutive this aircraft is when compared to its precursor, the Aichi D3A. There is a strong contrast in philosophy to US Navy dive bomber development which developed from the fragile Vought SB2U to the monstrous SB2C Helldiver. Even with an internal bomb bay the Suisei is no larger than the SB2U! Folding wings were not needed for handling this little aircraft on carrier elevators. Altogether it is a fine exponent of Japanese WWII aviation technology - compact, beautifully streamlined and pleasant to look at. I first encountered this Fine Molds kit some time in the mid-nineties at my local model shop. The launch of this product has certainly contributed to modellers' interest in the subject. 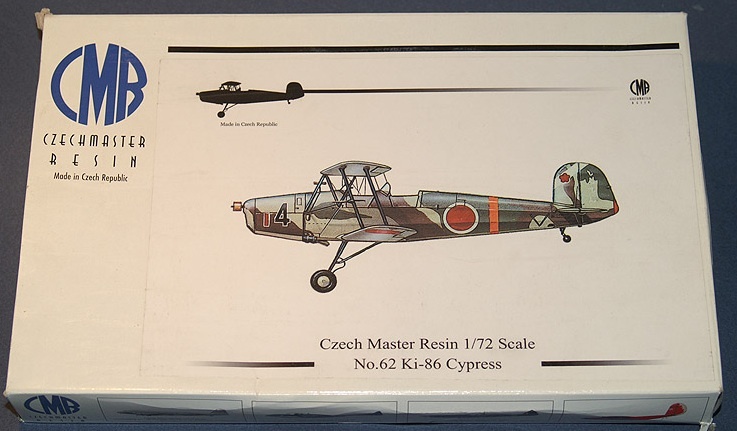 Fine Molds was new to the market and allegedly the top 1/48 brand, a Hasegawa de luxe and very expensive. Attracted by the dramatic monochrome box art, I was curious and paid the unreasonable price. Twenty years passed before I started the project. 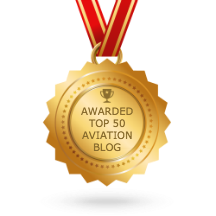 It was a good decision to wait because the latest publications and aftermarket accessories, my improved skills and knowledge of the matter enabled me to build a better model. 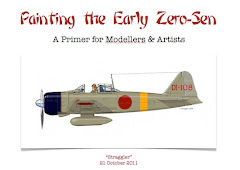 I had read a number of build reports before I started the kit, and many authors praised it highly. Sorry that I don't agree, guys, but I'm underwhelmed (as my American friends would say) by its particulars. My earlier modelling reports reveal that I like to renovate and upgrade 1/48 models of the 1970s era from Otaki, Fujimi and even Monogram. Therefore I'm not very critical of the raw material - an appealing model can be built from any kit. However in this case I had expected more from such an exclusive and expensive product. Let's begin with the positive aspects: the overall shape and dimensions seem correct, the plastic is easy to cut and sand, it has a nice surface with fine panel lines and most of the white metal parts add valuable detail. On the other hand the Fine Molds strategy of offering a base kit that allows them to delineate all D4Y variants creates a fundamental problem. Understandable from an economic point of view, it leads to an awkward cut of main components (see picture) which to make matters worse are a poor fit. 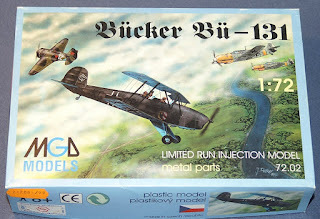 I acquired the separate and optional Fine Molds accessory set to further improve the model but felt that at the prohibitive price of the kit it should have been included! Unfortunately the instructions for the set are enigmatic and the bending lines of the photo-etch parts are so thin that they break. There are a few other weak areas that will be highlighted during progress. Finally, criticism aside, I concede that this is a very solid kit for creating a respectable model as I have seen other modellers achieve. The interior consists of the kit plastic parts, the included white-metal parts and the additional photo-etch accessories, some of which replace the plastic. Whilst the rear cockpit detail is quite gratifying the pilot's compartment is more imaginative than accurate, particularly the side consoles which I removed and replaced with pieces from the scrap box. There are some beautiful parts like the telescopic sight, the drift meter and the 7.92 mm Type 1 machine gun, which nonetheless I exchanged for an Eduard Brassin MG 15 because the moulded-on magazine didn't fit under the canopy. Two of the photo-etch parts are also worth mentioning, the rear gun tray and the frame for the cockpit separation window - very realistic and easy to handle. Less convincing are the seats, from which I scraped away the crude moulded belts), the ring mount for the gun (got deformed when I drilled the holes) and the photo-etched instrument panel and front gun arrangement from which I used only the panel and discarded the rest because it demanded a complicated bending procedure that ended with all the elements breaking apart. The instruments, by the way, are too small but there is not enough space for larger decals. For the canopy I used the respective parts from the Falcon IJNAF set in combination with the original kit transparencies. Once I was happy with the cockpit I decided to invest some extra time in crafting a crew from the excellent Modelkasten "Rabaul Zero Fighter" aircrew figures. The D4Y3 was equipped with a Mitsubishi Kinsei 62 14-cylinder radial. I replaced the kit's one-piece engine block with a Vector Kinsei model which has more depth. Oil cooler and supercharger air ducts were cut open, and the oil cooler inlet enhanced with a piece of mesh. A firewall was needed to fix the new engine. I also produced open cooling flaps with internal actuators. Fine Molds could have done a better job representing the exhausts which are too small. I enhanced them with jackets of thin paper which also gave them hollow nozzles thus avoiding difficult drilling. In parallel I had completed the propeller. As I couldn't attach it at this stage I overlooked a problem that haunted me when the model was all but finished. Not only are the holes for the prop blades too wide, the spinner with back plate is a little longer overall than the original. That doesn't sound too dramatic but can destroy the good looks of the nose profile. I'll come back to this later. After joining the fuselage halves I connected the front section which by exception fitted perfectly. (Some other builders seem to have had problems there). My happiness didn't last long, however, because fixing the separate oil cooler took one hour of cutting, filling and sanding. Even worse was the process of matching the rear fuselage underside which is molded as an extra part to alternate it with the booster rockets for the D4Y4 model. Thank you Fine Molds for having me spend a sunny Sunday afternoon with putty and sanding paper! To get to this point had required more effort and attention than I had expected but the harder the task the more fun we modellers have, right? My adventure will continue with the second part of the Suisei story. In the meantime a glimpse into the future to show that we do eventually arrive!